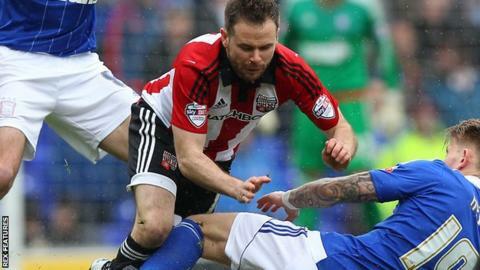 Brentford midfielder Alan Judge is to have further surgery on the leg injury which has kept him out for a year. The 28-year-old has not played since suffering a double leg break against Ipswich in April 2016. Judge recently resumed light training with the Bees, but will be operated on in the next two weeks. "A procedure to stimulate further bone healing is the next and definitive step," Brentford's head of medical Neil Greig said. Brentford have not confirmed how much longer Republic of Ireland international Judge will remain on the sidelines after the operation.